Anil Kakodkar the brilliant scientist with a prolific mind is a man who has been the reason of the development and the success of the nuclear program in India. The early life of Anil Kakodkar was inclined towards enhancing his knowledge and awareness. Anil Kakodkar, the man with astute and exceptional intelligence was born in a Maratha family. His parents, Kamala and Purushottam Kalkodkar both contributed to the freedom fight of India. Anil completed his basic education from Barwani and Khargone and graduated from the University of Mumbai with a degree in Mechanical Engineering in 1963. In 1964 to further enhance his knowledge, he went to the Bhabha Atomic Research Centre (BARC). Anil got the privilege to pursue his master’s degree from the University of Nottingham in 1969. This spectacular personality has been honored with the Padma Bhushan. Anil is a name that is familiar to almost everyone because of his contributions to the field of science and technology. This brilliant scientist by his spectacular aptitude and savvy has played a major role in upgrading the technological skills of the country. Anil joined the reactor division of the BARC and was involved in the designing and construction of the Dhruva reactor. His contribution to this high tech project made Anil stand out of the crowd. He was among the team members of architects who were responsible for the peaceful nuclear test of the nation in the year 1974 and then in 1998. Anil is known to have played an important role in the development of the pressurized heavy water reactor technology. He has not only developed but is also known to have deployed two reactors, Kalpakkam and Rawatbhata. Anil got the designation of the director of BARC in the year 1996. Because of his out-standing and magnificent intellect, he was given the opportunity to lead the Atomic energy commission of India in 2000. He is the secretory of the Department of Atomic energy. Anil has 250 publications that are basically focused on the ways to enhance the use of energy in India. He strives to develop electricity using cheap thorium resources. Anil has not only provided the nation with sovereignty but has also given a lot towards enhancing and improving the technology in the country. Anil for his exemplary work has been felicitated with honors like; Padma Shri in 1998, Padma Bhushan in 1999 and Padma Vibhushan in 2009. 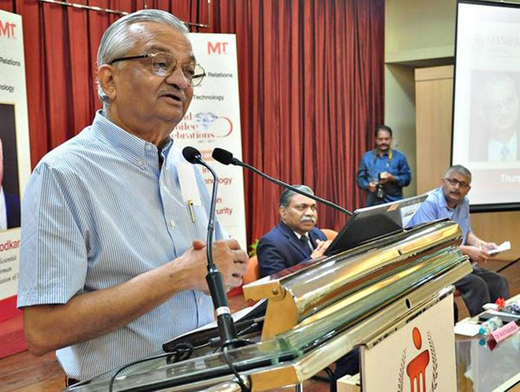 Anil Kakodkar, the Brilliant scientist has given a new edge to the field of the Science and technology of the nation. Anil through his intellect has taken the nation to a new level. Anil has worked tremendously hard to develop the Dhruva reactor. Most of the research conducted by Anil was focused on converting the thorium resources in the source of electricity. Anil, through his out of the box thinking, has proved to be an inspiration for the entire youth of the nation.